Tilava, rentouttava, kaunis ja erittäin mukava, hyvä sijainti, hyvin yksityisyyttä perheen ja ystävien. Sijaitsee 4 km päässä kaupungin ja 8 km Ao Nang Beach, talo on paikallinen arkkitehtuuri, nostetaan 1 metrin korkeudella maanpinnasta, taustakulissina upea kalkkikivi kukkuloita ja vehreitä hedelmätarhojen ja kumi puita. Siinä on 2 makuuhuonetta, mahtuu 4 aikuista ja 3 lasta, 2 kylpyhuonetta, ilmastointi, 160 neliömetriä iso olohuone veranta ja puutarha, televisio, Wi-Fi, keittiö, ja perus keittomahdollisuus, jääkaappi ja pesukone. Talo on moderni, yksinkertainen, tilava. Tunnet olosi kotoisaksi heti. Pääsy rannalle ja keskustaan ​​on julkisilla mini-bussi, paikallinen taksi nimeltään "tuk-tuk", tai vuokrata auton tai moottoripyörän. Se kestää 10 minuuttia rannalta, 5 minuuttia keskustaan. Kätevä kaupat ja ravintolat ovat lähellä. Naapurustossa on rauhallinen, turvallinen ja ystävällinen. Ympäristö on erinomainen. Hillside Krabi on hyvä paikka perheen ja ystävien kanssa. Jotkut saattavat haluta yhdistää työn verkossa ja rantalomille tropiikissa, mutta pysy kaukana joukko turisteja rannalla. Krabi Hillside on erinomainen lomailuun. Pavinee was an excellent guest and a charming person. She answered quickly to all my questions before traveling to Thailand. She accepted to help us reserving taxi or tour to the islands and Phang Nga national park. Always disponible by phone or whatsapp. 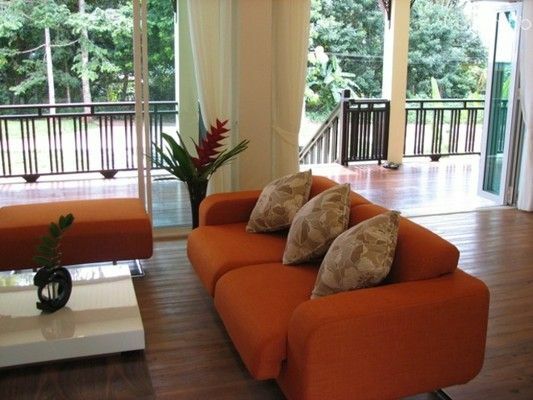 The house was just perfect as the photos show with a nice view to the jungle behind and a terrace at the front. Ao Nang is not to far taking a collective taxi just in front of the house. Local restaurants are also at about 100m from the house. Less touristic and more "true" than Ao Nang apartments. Pavinee a été une hôte superbe et toujours disponible aussi bien avant notre arrivée que sur place. Elle a répondu à toutes nos questions préalables mais à sû, à notre demande, nous réserver taxi ou excursions. La maison est vraiment superbe avec deux grandes chambres. Les photos ne sont pas trompeuses et l'ensemble est extrêmement propre. La climatisation fonctionne très bien de même que la WiFi. La localisation est même un atout : en étant un peu éloigné de Ao Nang l'ambiance est plus authentique. Les taxis collectifs sont devant la maison (qui est éloignée d'environ 50-100m de la route) de même que 2 à 3 restaurants moins chers qu'à Ao Nang. Un excellent choix pour nous. We had a great stay. (2 Couples). Internet worked well, the house was absolutly clean. Surpab and his wife were great hostes, they organized scooters, taxi's, lunch and everything else you asked them. They offered to call them at night every time when the taxi Driver don't know the way to the house. We had to call them once and it worked perfect. What's not in the description: you Need something to drive (scooter, car) if you want to be flexible (public Transportation and Taxis are not that flexible). 15 min to AoNang Beach, thats ok. At night a lot of noise from Dogs all around the place is not so good. washing mashine worked well. One bedroom has no direct (and own) bathroom. They have to through the living room. Thats not perfectly described. And there is only AC in the 2 bedrooms, not in the living room and kitchen. This house was perfect! After finally returning home and looking back on the trip i cant imagine a better vacation rental for our krabi adventure. We were able to pull off an amazing american thanksgiving holiday feast and i dont know how we could have done it as well anywhere else. The house was super clean and well stocked with appliances and everything one might need to feel right at home. The view off the back porch is amazing and the epic cliffs shoot up straight towards the sky. Suparb and his family were more than accommodating and warmly welcomed us into their home and helped us out in every way possible and were all very friendly. Definitely a very modern and comfortable feeling home i would recommend to anyone coming to the area. Thanks again for everything Suparb and family we will hopefully be back one day!